This is something my mum created many, many years ago. She loves trifles, it is her favourite dessert. She loves how they are moist and creamy. This is something my mum used to take to parties all of the time when I was growing up, and it was a huge hit. I made it into a trifle here, but my mum used to take it to parties as a slice. She would not add a second layer to her slice, she would just have a larger dish and make it in one layer. Then you can slice and serve it for perfect sized slices. Looking at the picture above, you may think it is too creamy, but it really isn't. The sponge fingers are so spongy, you would think you actually baked a sponge, they don't taste like sponge finger biscuits. 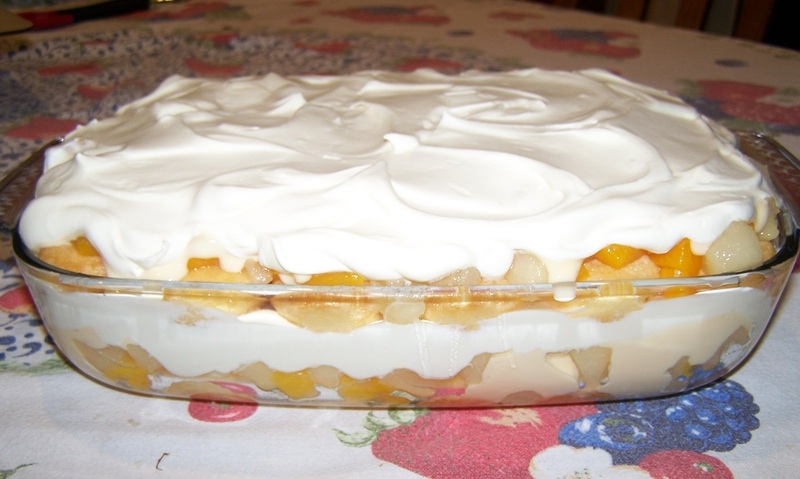 The custard and cream work beautifully with the two fruits. The end result is a light, fluffy, moist, gorgeous trifle, each mouthful is lovely. It is quite a refreshing trifle. Again as with most of my recipes, it is not really sweet. It is perfect in that respect. This has got to be the easiest trifle to make. It is what I should have called 'my pantry item' trifle. It is made with a few store bought ingredients, great to whip up when you have people coming over but you don't feel like cooking. As I don't even classify this as cooking, the only thing you actually do is whip some cream. Your custard needs to be thick if you want to serve it as a slice. It is best if made the day before you want to serve it. But you can make it in the morning if you need it for a dinner party. Drain the compote over a medium sized bowl, to separate the syrup from the fruit. Reserve the syrup in the bowl. Whip the cream until thick, but not too stiff. Use any dish you like, I happened to use an oval lasagne type dish, you could use a bowl if you prefer. If you want it to be a slice, use a dish that suits that type of serving size. 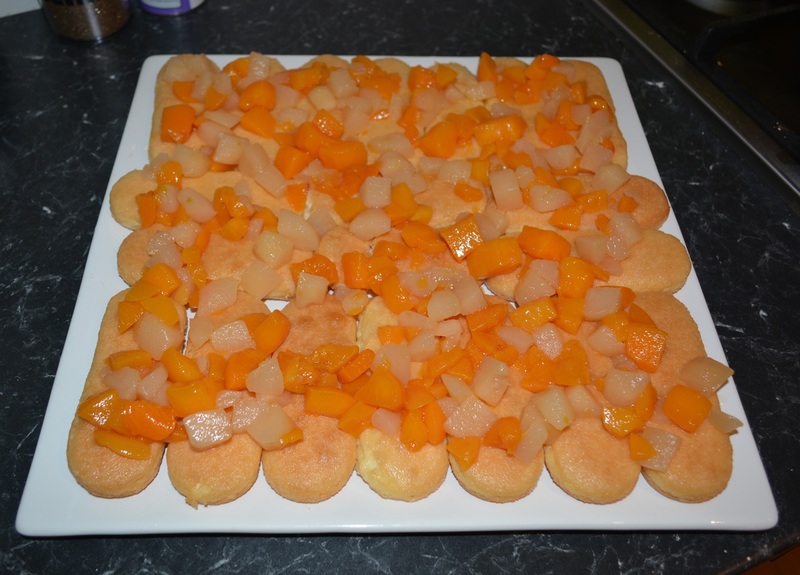 Dip half of the sponge finger biscuits into the reserved juice for 4-5 seconds if making a trifle or all of the biscuits if making a slice. Layer the biscuits side by side in a single row in the base of your dish. Scatter over half of the fruit if making a trifle or all of the fruit if making a slice. Spread it out evenly. 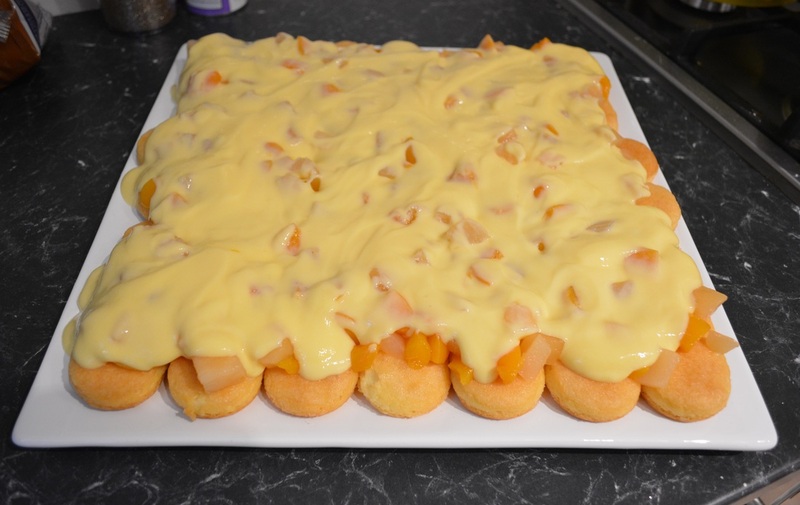 Dollop over half of the custard if making a trifle or all of the custard if making a slice, spread it out a bit. 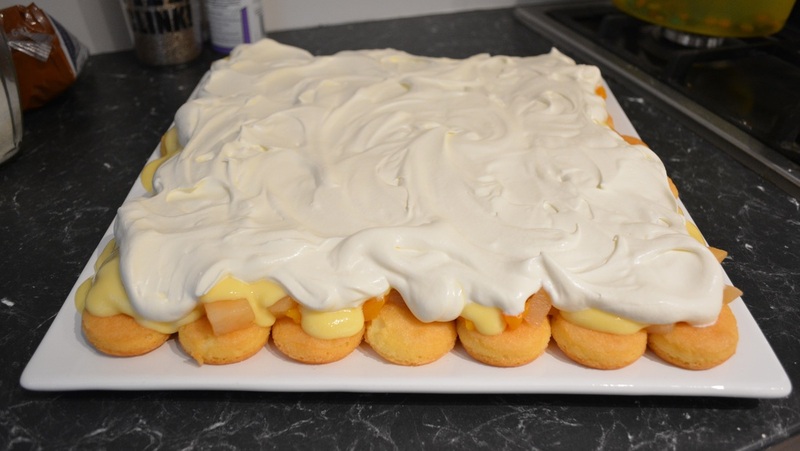 Top with half of the whipped cream if making a trifle or all of the whipped cream if making a slice. 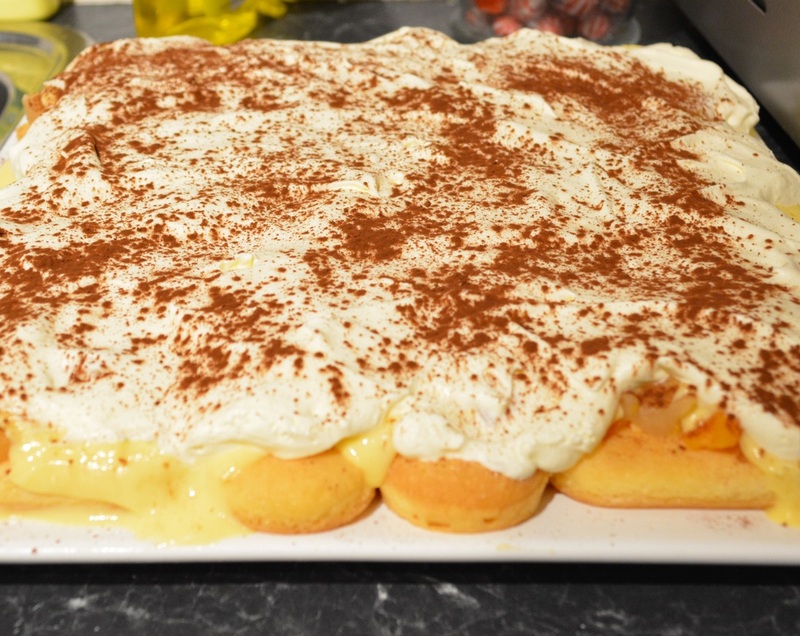 If making a second layer and serving it in trifle form, repeat with remaining biscuits, fruit, custard and cream. Sprinkle over the grated chocolate or sifted cocoa. Refrigerate overnight or until needed.